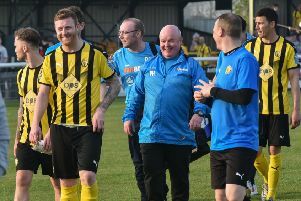 Leamington boss Paul Holleran says the decision to tie Matty Stenson to a one-year contract was made before the season started. Stenson has made a flying start to his Brakes career, continuing his prolific goalscoring form from Leicester Road and Barwell through pre-season and into the National League North campaign. It prompted the announcement last week that the 24-year-old had signed a one-year deal with the club. However, Holleran says the club never had any doubt the player would be a success with the contract on the table ahead of pre-season. “It was there for him in the summer,” said Holleran. Holleran added: “If he stays fit and plays enough football he is going to attract a lot of interest. “He’s a number nine and there are not a lot of them about. “Clubs in our league are playing £50,000 for players who are not as good as him. “We’re getting ahead of ourselves here, but if the right club comes in for him we wouldn’t stand in his way. Stenson was withdrawn due to a tightening of his calf in the midweek defeat at Hereford but it is hoped he will be fit to face Guiseley on Saturday.